This furniture is great for the price! We are very happy with the quality. I would recommend if you are not looking to break the bank but get something that looks nice. Shipping was fast too! Revel in serene and leisurely sunlight with your favorite folk on this distinct and durable 6-piece patio sectional sofa set by Corvus. Each piece is separate for personalized arrangement, and the pieces clip together to create a sofa large enough for tranquil and luxurious gatherings. Hand-woven wicker is resistant to inclement weather and the rays of the sun for years of effortless elegance. 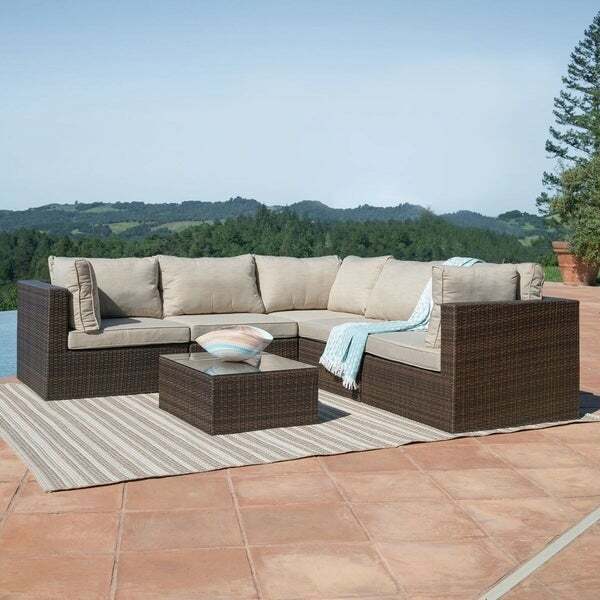 I have this Corvus Tierney Outdoor 6-piece Wicker Sectional Sofa Set since December 2016, elegant and last beautifully, cushions need waterproof spray or waterproof storage bin. Love it!!! You can pay $4000 people, but this set is pretty darn nice. It is low for someone over 6' tall, but for the average person, it's just fine. It is brown, with very light tan pillows that have a small dark gray thread thru them, really nice. The seat cushions could have a denser foam in them, but in time, I'll replace. I rec'd this set within one week. One of the pieces had a small dent in frame, which didn't effect connecting them and you don't see it. It is was in the front, I would have returned that piece, didn't want to take all the time and trouble for a little dent. All in all, perfect! Looks just like something out of RH. Quality is excellent, I know there are several other similar models of this style furniture to choose from -I purchased based off of only a few reviews and I absolutely do not regret it. The color is a coffee brown wicker with seat color comparable to 'belgian linen sand' from *** . I am pretty pick when it comes to furniture but this exceeded my expectations. Thank you! We analyzed outdoor sectionals on Overstock, Target, Wal-Mart, and Wayfare. We like the frame and seat back cushions. But after a month, the seat cushions are wearing thin. So thin, you start to feel the chair frame when sitting. (We have merely sat on the couch.) It is located on a screened in back porch. Frame looks really nice and it is actually a deep seat! We do bring the cushions inside if it looks like rain.---they are not water resistant. Bonus! Set up easy. Only room in the house we all fight over to sit on or sleep on. I looked for months and read every review before deciding to purchase this sectional. Unfortunately, what I received is nothing like what is described in the reviews. The quality of this sectional is 100% worse than what I've seen sold at Big Lots and at Grocery Stores but sold at fraction of what I paid for this one. It is almost unbelievable that Overstock would think any customer would pay $1299 for a product and expect anything less than quality that is commensurate with cost of the item. The wicker is ridiculously flimsy and offers zero support. There is nothing supporting the seat areas of the sectional but the wicker weaving itself! And to add insult to injury, the wicker weaved onto the frame from that attaches to the seats and also the sides of the sectional are coming undone pre-use. To make matters worse, there is no way for me to know if I got the Corvus Tierney sectional or the wrong sectional because it has no markings no tags nothing that says who made it. The only markings were on the box- Starsong China. It's been two days since I submitted my return and no one from the oversized department has contacted me yet. Arrived quickly & in great condition, there are many ways to configure this & the bottom clips are easy to use. Very comfy, my family loves it. One suggestion is to not leave this out during the winter months as the cushions are a light color. I hunted for month for the perfect outdoor sectional. I knew I wanted clips so it stayed together, which this has, I wanted cushion covers that come off so I could wash them, which this has. That the cushions had to be comfort. The bottom ones are super firm but the back ones are super thick and comfortable. And the colors are perfect. A trendy brownish gray cover and the fabric is light with a darker thread perfect for disguising dirt. Everyone that sees our sectional says they are jealous! It's ok piece but not very sturdy and it's very low to the ground , if I had to buy it again I wouldn't buy it , very cheap , cushions are not very high either , I had high expectation about this piece and definitely didn't meet the expectations , it's nothing like the picture , it's hollow bottoms with enforcement at bottom , very light in weight one person could transport each piece by themselves I'm a little disappointed , delivery was very fast and the delivery guy was excellent. The first set I ordered was damaged so I was somewhat put off however I declined the product and easily got Overstock customer service who asked if I wanted a full refund or another set sent out. I had another set sent out and it was delivered quickly. Set is easy to setup and comfortable. For the price its amazing. Great couch and very comfortable. The only thing I had to assemble was to screw the little leg on the bottom of each section. I would recomend the piece to anyone looking for a great outdoor sofa. You can configure it in many different positions to fit most any space. We use it on our balcony and it now feels like we have a second living room. Comfortable couch! Lower than I expected but it works since I'm short! Was worried about the cushions based on other reviews but both the seat and back cushions are great. Have only used it as an L shape but excited you can switch up the design whenever you want to. Not happy with the quality of the sectional not worth the price I wish that I could have returned it for a different set. Cushions are thin. Other than that its a great set. "The description lists the cushion depth as both 3.9" thick and 4.7" thick? Which is it?" "I bought this set and it is a great value for the size/look. The cushions were completely destroyed by some raccoons (long story) and I had to throw them out. Can I buy a new set of cushions? Thanks "
Unfortunately, the cushions are not sold separately. "Can individual pieces be purchased to add to this set?" Unfortunately no, we apologize for the inconvenience we might have caused. Corvus is not selling the individual pieces currently. But you can customer service for more information. "The wicker appears to have different shades of brown woven together. Overall, does it look dark brown?" Yes. The chairs are woven from wicker in different shades of brown. It looks dark brown overall. "Can you purchase an ottoman to go with the set?" Sorry we are not offering the ottoman separately. We recommend you contact our customer care for more details. Thank you. "How do I purchase COVER/COVERS for this sectional?"